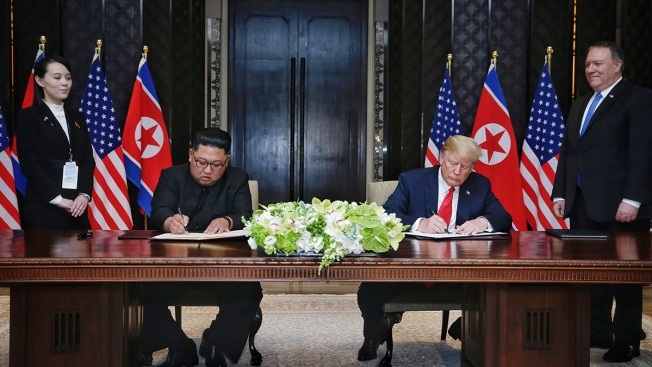 In this handout photograph provided by The Strait Times, North Korean leader Kim Jong-un sits with U.S. President Donald Trump (R) during their historic U.S.-DPRK summit on June 12, 2018. The U.S. has stationed combat troops in South Korea since the Korean War ended in 1953 with an armistice and no peace treaty. In further explaining his reasons for suspending major exercises, Trump said they "cost a fortune." Sen. John McCain, chairman of the Senate Armed Services Committee, called the suspension of drills a mistake. President Donald Trump's decision to suspend major U.S. military exercises in South Korea could weaken allied defenses, depending on the length and scope of the hiatus. But the potential for diplomatic damage seems even greater.